Air Itam is the area where my grandma used to reside, and the place in Penang my father grew up in. This hometown brings a lot of memories to my family, although I spend all my life in Singapore. I remember stepping on "cow dung" when I was probably 7-8 years old outside my grandma's house, mistaking it for a tree trunk. Yes, cows roam around the residential area of my grandma's place. No, it's not a "kampung" if that's what you all are thinking. It's a pretty huge three-storey terrace house, which has a steep flight of stairs, three dogs, and a supposedly sound-proof music studio converted by my uncle for his piano and singing lessons. At some point of time, I also remember my uncle turning the house into a video rental house. At that time, video tape rental was a lucrative business. Those were the fond memories, yes, that's part of my childhood memories. Not so much that I grew up there, but a place where I spend my year-end school holidays. Now, with my grandmother no longer with us, the house has since been sold since my uncle has also moved to KL instead. The most popular sight at Air Itam market is likely the Kek Lok Si Temple. This is probably one of the largest temple in Southeast Asia, built on the hill, which also houses a columbarium. However, for this post, I'm not going to talk introduce much on Kek Lok Si, but more of the quirk market. Traffic is usually very heavy and crowded at Air Itam Market. On that morning, we went there around 11am in the morning and the crowd has started to slow down. Usually, the market is most crowded around 9am. Vegetable stalls, poultry stalls, fruits stalls, dry goods, snacks stalls. It's lined up on the sides of the streets. Basically, it's like a market, but on the sides of the road. Can you find some of the "old-school" stuff in this road side stall? Can you guess what this uncle is selling? Or do you think it's scary animal? Not to worry, it's just wild bore 山猪. The meat is supposed to taste tougher, since it is from the wild and has the ability to move around. But I would still prefer the tenderness of pork that is bred in the farm. Check the below picture out on the left! Yes, snakes, turtles are sold. Obviously, the snakes and turtles are not for food on the table. I irk at the thought of anyone buying snakes. But both are probably for what someone describe as "animal liberation", or in Chinese, 放生. According to some religious beliefs, some people do believe that freeing captured animals will help them to atone for their sins. And in Penang, there's a famous snake temple. I do not know if animal liberation is being performed there. But I hope it's done there instead of anywhere else. Otherwise it will be scary! 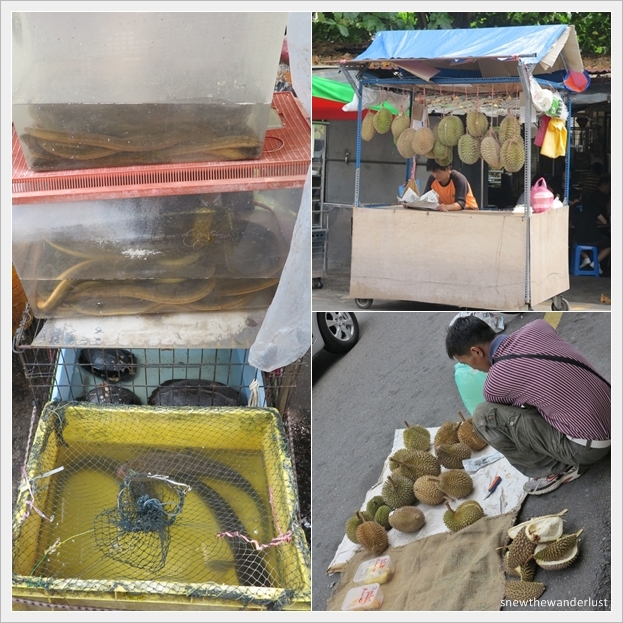 The photos on the two separate durian sellers. See how one hang his durians nicely on a cart to sell, while the other just spread it on the floor in such a primitive way. A famous shop in Air Itam Market area is Cheong Kim Chuan. This is an old traditional shop, famous for it's nutmeg products - preserved nutmeg, nutmeg medicated oil. The shop also sells Malaysia local products such as belacan, Tau Sar Pneah (Tambun biscuits) and so on. The Air Itam Market has pretty good hawker stalls. Popular stall includes Kway Chap, Kuay Teow Teng, Char Kuay Teow. One of the locals that we shared table with, told us that the Kuay Teow Teng (Rice noodle with fish ball and minced pork) used to be much better. The son took over and business starts to dip. I heard similar stories or comments on other the standard of local Penang food. I really wonder if the next generation would still be able to maintain the legendary taste of Penang Hawker food. Nothing beats the famous Penang Assam Laksa at Air Itam Market. I am not a huge fan of Penang Assam Laksa, but I still try this "must-try" dish from this famous stall. You can order and ask the stall assistant to bring it into the opposite hawker market. However, you need to sit on the section that does not have another competing Penang Laksa stall. Although I still prefer Nonya Laksa, this is really good.The flavour is thick and they do not sting on the tuna fish. No wonder it has so many good reviews.